Of all our Great Glen Way holidays this is the one for the more serious walker, covering the entire Great Glen in just 5 days. If you are a fit, regular walker who wants to concentrate on completing the Great Glen, then this is the walk for you. Note for 2019: The low-level path between Fort Augustus and Invermoriston will be closed at times during 2019 whilst Scottish Water carry out works. Walkers will be diverted via the high-level route when the low-level path is closed. The distance is about the same but it does involve a bit more ascent and descent. We recommend bearing this in mind in choosing your holiday, particularly if you are considering our shortest itinerary which covers South Laggan to Invermoriston in one day, as extra effort may be required at the end of that stretch when your legs are tired! Please contact us if you have any questions. 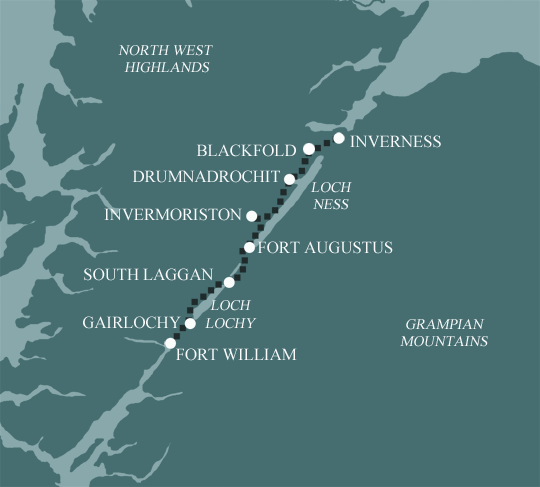 The route starts in Fort William, on the shores of Loch Linnhe and in the shadow of Ben Nevis, Britain’s highest mountain. Views of the mountain and its fearsome North Face cliffs can be seen over much of this section, weather permitting. The route leaves the shores of Loch Linnhe, heading inland past Neptune’s Staircase, a series of locks near the strait of the Caledonian canal. From here the route takes the riverside path and canal towpath to highland villages of Gairlochy, at the foot of Loch Lochy. This 13 mile section follows the northern bank of Loch Lochy for its entire length. It is characterised by fairly easy walking on forestry tracks, footpaths and minor roads. There are spectacular views over Loch Lochy to the high mountains beyond. The canal towpath and old railway track bed take the route along the tree clad shores of Loch Oich, a nature reserve resplendent with native woodlands and wild flowers. There are views across the Loch to the ruins of Invergarry Castle, once the seat of the famous MacDonnells clan. Fort Augustus, established by General Wade in 1729, is soon reached. St Benedicts Abbey and cruises on Loch Ness provide diversions here. After a steep climb out of Invermoriston with fine views of Loch Ness, you will walk on steep undulating forest tracks until Grotaig. From here the trail changes to moorland and farmland with views over the Great Glen and onwards to Drumnadrochit, known locally as “Drum.” You could take a rest day here to visit the impressive Urquhart Castle and cruise on the mighty Loch Ness. Today will be the most challenging day of all your walks. It is a long and varied day walking on exposed high moorland, farmland and woodland, finishing on the rural paths of Ness Islands before viewing the impressive setting of Inverness Castle, where this walk finishes. The Great Glen Way is a very appealing walk on good terrain. It is easier than the West Highland Way as it is less strenuous, but it still requires good planning and preparation. No problem for regular walkers! Terrain: The route generally follows the Caledonian Canal, loch shores, and well made forest trails on the lower slopes. What’s it like underfoot? Pretty good. Well maintained canal towpaths and forest tracks. Shorter sections can be rougher or muddy, so good footwear is essential. How Much Up & Down? Amazingly little considering the size of the surrounding mountains! Some short steep ascents and a longer climb of 300m to Blackfold on the final day. Signposting: Generally good, but use you map and guidebook as well. Navigation: Pretty straightforward. You may encounter hill fog on the moorland around Blackfold, but the route is well defined. General travel information on the Great Glen Way area will be in your holiday pack including train and bus timetables where available. By Air: The nearest international airport is Glasgow (GLA). There is a regular shuttle bus into Glasgow city centre (approx 25 mins). From Glasgow city centre there plenty of direct trains to Fort William. You can travel by train straight from the airport if you wish; it just makes your journey time slightly longer. 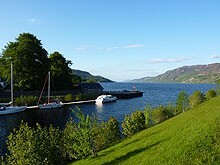 By Road: From Glasgow in Scotland, Fort William is 108 miles north – approximately 2.5 hours by car. For Glasgow travel on the M6 north then the A74(M). For the most direct route to Fort William from Glasgow, follow this sequence of roads: A81, A804, M8, M898, A898, A82. By Public Transport: To return to Fort William there is a Scottish Citylink bus service number 919 from Inverness. Inverness has a railway station for onward travel by train. By Road: When traveling back into England or Wales, head for either Edinburgh (157 miles) or Glasgow (171 miles) depending on the direction of your final destination.